There are a couple of techniques today – as an added bonus for you. OCFM International Coach John Andrews teaches both of them. The first one is a hideous Neck break followed by dislocating and breaking both arms. The 2nd technique takes our famous Thai Strangle and shows how to turn it into a throw and a Sternum break followed by a strangle or yet another Neck break. Johns ”unique” humour about it really being pointless to break both arms AFTER the Neck break – as the bad guy will not feel it anyway – did have the whole crew and myself in stitches at the time – luckily we were out of Audio range. I MUST point out that within our Circle we use a lot of ”gallows humour”. Again I STRESS the need to train these techniques exactly as John taught them. Please note how ULTRA EFFICIENT John is in movement and taking space. No gaps and no extra movements required, everything kept tighter than my wallet on a night out. Have fun training them – AND BE SUPER CAREFUL! 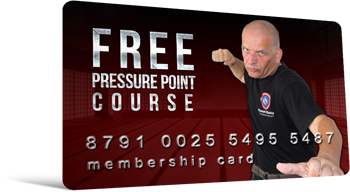 These techniques are on our 6 DVD Set Pressure Points Black – which is currently on Special Offer.